I typically bring quite a few souvenirs home, but this trip was a little different since we really didn’t have time to shop. I’m not an impulse buyer, so even in another country it takes me a long time to select exactly what I want to buy. Though I would have loved a nice alpaca wool blanket, I have no regrets because the treasures we did bring home were our experiences. Salt from Maras We visited the salt evaporation ponds in Maras and brought back three packages (gave the other two to our moms). Coffee While hiking the Salkantay Trail, we visited a coffee farm and got to help roast and grind these coffee beans! Turn Right at Machu Picchu Another hiker on the trail with us recommended this book, so I picked up a copy in the Lima airport on the way home. I love to read a novel about the next place I’m going to visit, and I wasn’t able to do that before this trip. 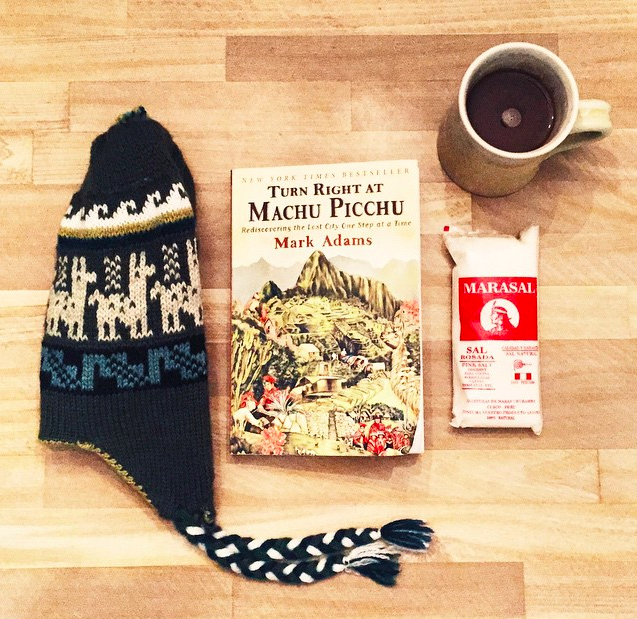 I would definitely recommend this book before you hike to Machu Picchu! The author took Hiram Bingham’s original route, and then took the classic Inca Trail. But he talks about many of the sites in Peru and it will help you understand what you’re seeing when you get there. Additionally, novels have a way of capturing little cultural tidbits and local customs that you may not find in guidebooks and internet research. I would have known, before I took that sip of Pisco, to pour a little out for the Pachamama! Absolutely love Peru and can’t wait to go back for more trails! Almost want to read the book again now that I’ve experienced some of the places he talks about, to get a better understanding of the sites.